Something as simple as adding the name of the destination country to an address can delay the delivery of mail to service members overseas. In fact, it can triple shipping fees if addressing the package is not done correctly for APO, FPO, and DPO mailing addresses. It is a problem that the military / government postal system encounters daily. To alleviate this situation, the following site has been developed. help is needed from the family and friends of deployed service members. Senders stateside are actually slowing the delivery of the mail by not properly addressing letters and packages. The sender needs to know the name of the country and the name of the base camp where a service member is stationed are incompatible with regulated military addresses. This will cause the letter to be misrouted through civilian international mail channels, causing a huge delay in delivery. Also, if you are purchasing something online, most shipping software for the website will default as a foreign order and charge you for overseas foreign rates, versus domestic fare. The U.S. Postal Service system has automated sorting machines that read the address and determine whether a letter or package goes through military postal channels, regular USPS or international postal channels. By writing Kuwait or Iraq on a letter or package it is routed through civilian mail channels rather than military mail. This is attributable to the sorting machine’s inability to discern whether or not the letter is intended to reach an Army or Fleet Post Office address. A recent case of this common mistake occurred when Soldiers’ mail was found in the post office in downtown Baghdad rather than being sent to where the Soldiers were deployed. There have been a number of reported cases of internationally channeled military mail being opened, searched through and/or tampered with -- a matter that could potentially be identified as a danger to both individual and unit security. It is important for loved ones who write or send gifts to deployed military members understand the step-by-step procedures and current updates made to the military postal service. Knowing the latest rules can help decrease the time needed to process the mail particularly in a war zone. Prior to a letter or package even reaching such far outposts and its final destination, it must undergo a series of transfers from the local town post office, the state's mail facility, and international gateways. The facilities of the United States Post Office not only handle international mail but also all of the international mail of the armed services. A small military contingent operates with USPS at these gateways to assist USPS in routing mail to overseas points. These Joint Military Postal Activities work to assure that USPS arranges, assembles and consolidates the letters and parcels to the correct locations, then dispatches correctly on commercial airlines. Both military personnel and USPS civilian employees work together to get the mail to its proper destinations. Mail sent to an APO/FPO address will go to California, New York, or Florida depending upon the suffix. Once it arrives at these locations, the US Post Office has delivered their package. It is now the Military Post Office job and their contracted airlines to get the package to an overseas member. That is why postage for overseas military members only costs domestic rates. Once the shipments arrive at the main transportation hubs in country, contracted drivers are standing by to drive the mail to the receiving camp’s main post office. The departures depend on local ground dangers, highway problems and the force protection that must accompany the convoys. The day the mail is delivered to the main post office is not necessarily the same day that all units arrive to retrieve their mail. There are literally hundreds of units situated long distances from the main bases or camps that are unable to get a hold of their mail everyday, for (vital) reasons such as operational security. 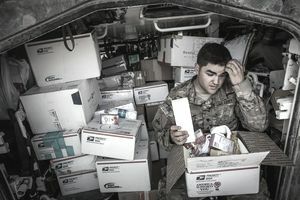 The routine of preparing, organizing and delivering mail to service members deployed to the Middle East is a method that the U.S military postal service evaluates and takes steps to enhance on a day-to-day basis.